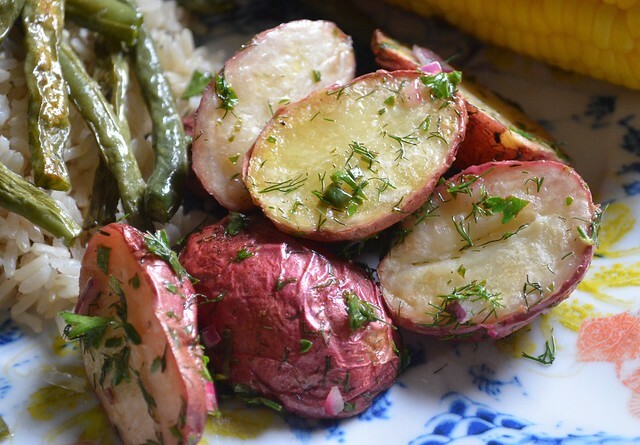 Potato salad is pretty much a summer table staple. You can bring it to a picnic or a potluck or even brunch, because somehow potatoes are one of those things that seem to work with any meal. Of course, I'm not talking about the gooey, traditional version laden with mayo and wilted celery. This version is a much fresher, lighter and zippier (that's real, right) that couldn't be simpler to make. 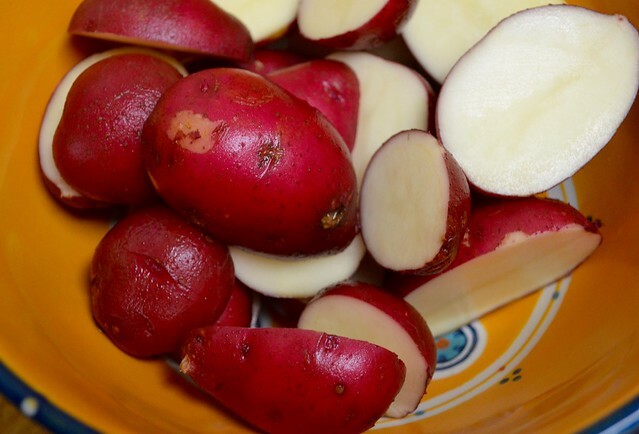 Start by halving your potatoes (or if using a larger type, dicing) and placing a large bowl. 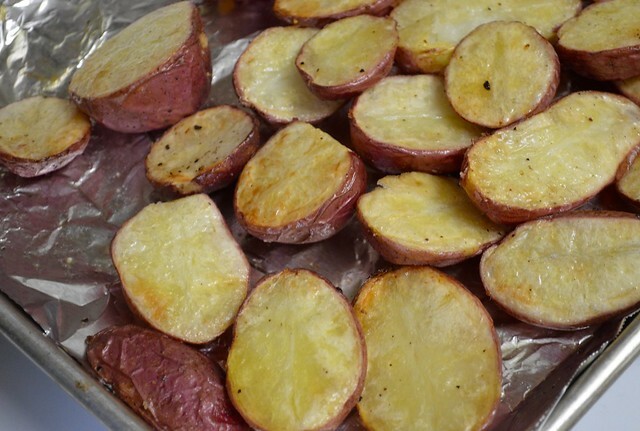 Cover the potatoes with water and allow to soak for 15-20 minutes to remove some of the starchiness. In the meantime, preheat your oven to 400 degrees. Drain the potatoes and then place on a large roasting pan, face down if halved, and drizzle with olive oil and a sprinkle of salt and pepper. Roast for 30-40 minutes under tender and the face-down side is golden brown. While you wait, or when the potatoes are nearly done, in a large bowl, add your chopped herbs, lemon juice, lemon zest, a little additional salt and pepper and another drizzle of olive oil. Whisk together. 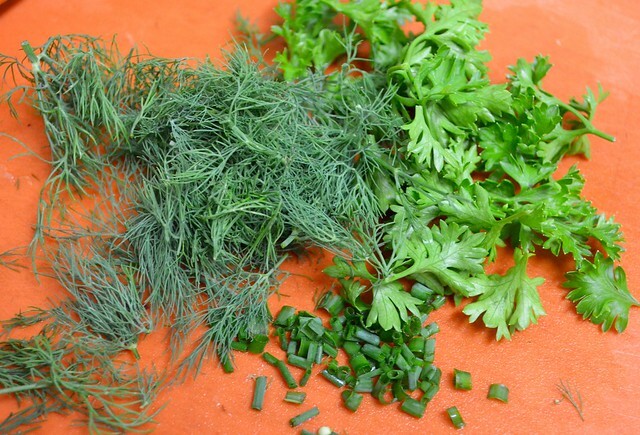 Now, you may be wondering: how much herbs should I be using? A bunch is a fairly relative term. Well, you're right. If I were you, I'd go a little herb-crazy. They're kind of what make this salad so spot on and summery. Of course you don't have to stick to dill, parsley and oregano. 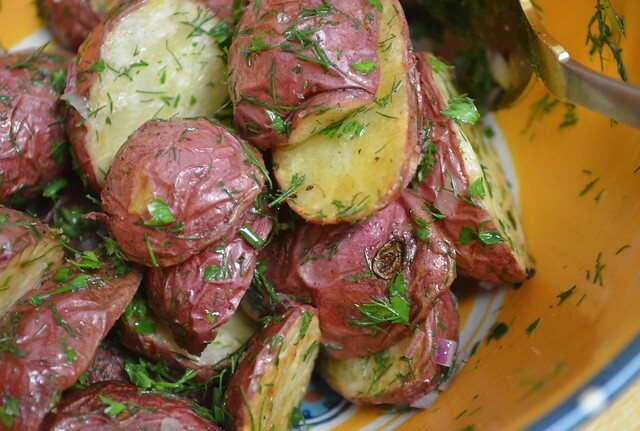 Potatoes work well with tons of herbs you'll find this time of year, so get some of your favorites and have at it. When the potatoes come out of the oven, (carefully) scrape them into the bowl with your dressing and toss until evenly coated. Serve immediately when the salad is still warm. 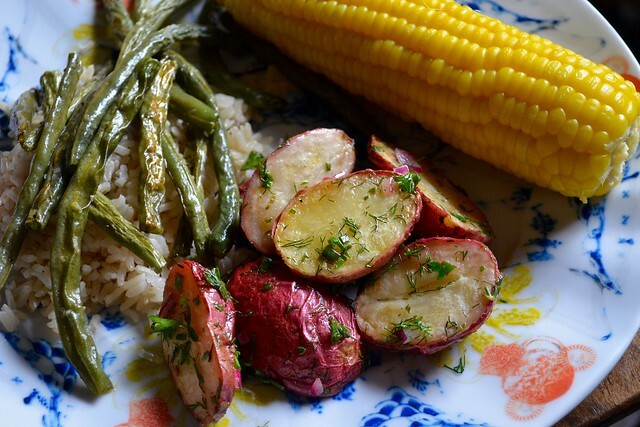 It works great with other summer food essentials like corn on the cob, grilled zucchini, etc. Try this (gluten-free!) potato pizza with garlic scape pesto. How about some roasted potato wedges with preserved lemon? For something totally different, try these vegan chickpea cakes with dill.